Is your child ready to start potty training? All parents eventually face this question, but there are several signs that can help you determine when to start potty training. The truth is that no two kids train alike. The secret to success in potty training is to tune into your child’s unique learning style. Telling you that they’re about to go, are going or have just gone in their diaper. If your child shows two or more of these signs, it’s a good indication that they’re ready to start potty training. Make sure you’re ready for the start of potty training when your child is. When a child shows readiness, that’s a parent’s cue to start preparing the child by buying products such as a small potty, training pants and children's books about using the toilet. You also can let your child practice on the potty. Surf the Potty Training Tips area of Pull-Ups.com for more advice and tips and take advantage of the learning games, quizzes and songs to help you motivate your child. Remember the basics of being a good coach for your potty trainer and keep things motivating right from the start by being patient, positive and consistent. Focus on what your child does right. Stay upbeat. You’ll make it smoother, simpler and more rewarding for both of you. When you and your child are ready to start potty training, make it a big occasion. Mark the start of potty training with the introduction of Pull-Ups® Training Pants and the potty chair. Steer clear of worrying about hard and fast deadlines. No matter what your mother told you, there’s no one right age to start potty training. Most children show signs of readiness sometime between the ages of 18 and 24 months. Once you do get started, potty training takes about eight months, on average. With a positive outlook and a little creativity, potty training really can be more about quality time. Find ways to encourage your child’s early interest. Play up the fun with activities like decorating the potty chair, picking out rewards or creating a special potty progress chart together. And don’t forget to load on the praise and rewards right from the start. Bragging rights and the expectation of applause are strong motivators to your child. So find those moments to celebrate and share them with everyone in your child’s cheering section. If your child starts out fine but then gets hopelessly stuck, no worries! It’s not unusual for the potty chair to go back into the closet for weeks, or even months. If your child loses interest, hold off for a few weeks and then try again. Toilet training is a developmental process. Children’s bodies and brains are developing all the time, and each new phase sets the foundation for those to come. No amount of teaching can make those developments happen before their time. You’ll have an easier, happy time of it if you wait until you’re sure your child is ready. 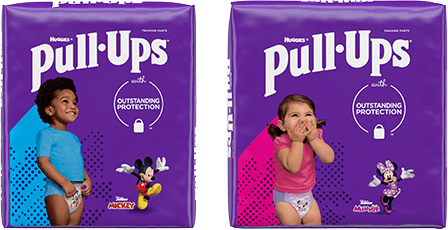 It’s Time to Potty with Pull-Ups®! Quiz: What's Your Child's Potty Training Personality?